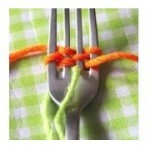 Crochet DIYers, when you have leftover yarn, what do you do with it? Do you have a bin full of small bound balls of yarn about the size of a cat’s playtoy? You don’t throw them away, right? Because they’ll be good for something someday — some future crochet project. Well, you can use those small scraps of yarn to make small projects, if you just know what they are. We already posted about crochet catnip bunnies, and this series about what to do with bits and pieces of yarn continues here with tiny yarn butterflies, the creation of Alessandra Poggiagliolmi at Home Made At My Place — actually, it’s a family tradition for her. Her mother taught her and her sisters during the cold Alberta winters of Canada where she lived as a girl. Those are cold, snowy, windy months, and yes, long months, as Alessandra remembers. So who knows how far this crochet pattern dates back through her family and the communities around them. And now she has offered a free pattern and pictures to the crafting / crocheting community. 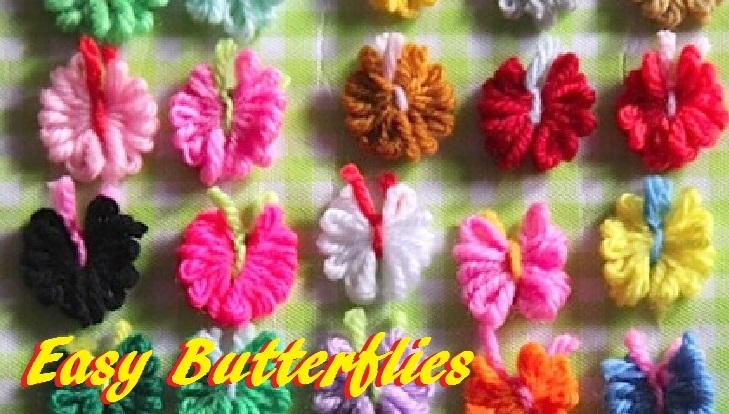 These colorful butterflies (although not exactly “crochet” per se, maybe, it is definitely in the general area of crocheting) only take a little yarn and can decorate almost anything. And you can make any number of them. Sort of like bows, you could make them when you wanted to add something to something else you were crocheting. Conceptual overview: You will start with the antenna / body — a 20cm piece of yarn, tied around a fork in a special way. The yarn is woven in a kind of mat over the fork, which is tied in the middle up-and-down (this up-and-down piece of yarn is another color and forms the body of the insect). The body ties the whole thing together and it can be pulled off the end of the fork, then the ends are cut into antennae and the butterfly is complete. To learn about Alessandra’s family and the pattern, visit her blog (click here) and for her full pattern, click here.